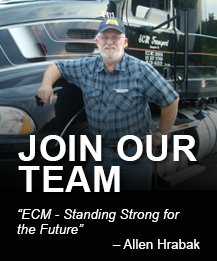 At ECM TRANSPORT, ensuring the safety of our customers, employees and our communities is our priority. We understand the importance of continuous training and are proud of our safety knowledge, experienced staff and ability to exceed industry standards year after year. We have established and continually maintain excellent motor carrier safety ratings and low accident frequencies. As a company, we have a solid safety performance history and will continue to be a leader in the area of safety and compliance, due to the dedication and professionalism of our fleet of drivers and vehicle maintenance personnel. At ECM, we offer industry-leading asset protection and security compliance programs. ECM TRANSPORT understands that our customers may have important and unique needs related to homeland security regulatory compliance, high-risk products, or brand protection. We offer consultation and proactive partnership to ensure that our customers' security needs are met. By leveraging modern and proven technologies, we provide for the integrity of customer assets while in-transit or at one of our facilities.